Jerry Sortomme, founder of Santa Barbara City College’s Environmental Horticulture Department,and Department Chairmen as well as lead instructor was honored recently for his lifetime’s work by his colleagues, former students and the community. 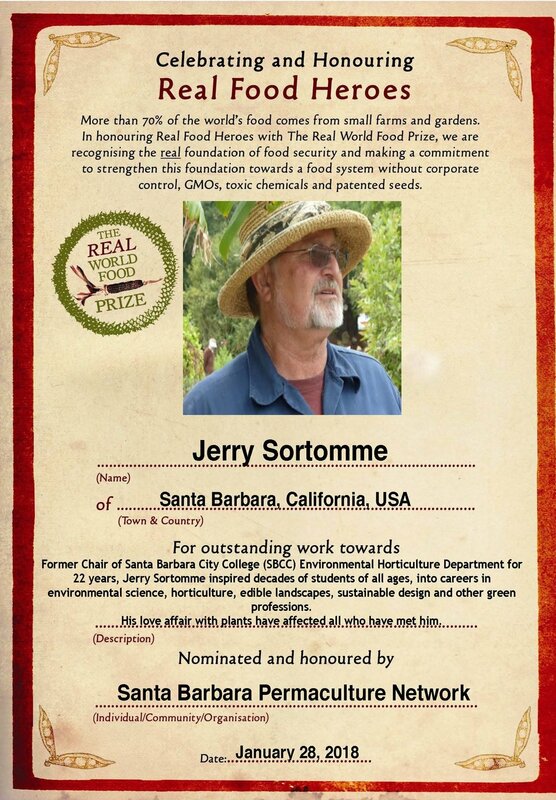 Sortomme, whose passion is teaching sustainable horticulture, received the Local Food and Plant Hero Award at the 10th Annual Santa Barbara Community Seed Swap last January. As one of “Jerry’s Kids” Karen Flagg took classes from Jerry in the in the ‘80’s and he later hired Don. Jerry has remained their good friend and valued mentor since. As founder of the Environmental Horticulture Department at SBCC Jerry has taught and mentored hundreds of students who have found their way into the horticulture industry. Some students have started or work at nurseries, some have started nonprofits or consulting businesses, and all carry with them a love and value of plants. Currently Jerry is growing historically significant plants with the help of many volunteers for Santa Barbara’s Mission La Huerta Historic Garden. Don Hartley, Jerry Sortonne, Karen Flagg at Trinity Gardens. Judy Sims, founder of Trinity Gardens and Jerry.